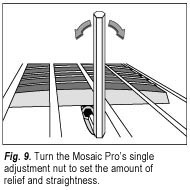 Truss rods are installed in the necks of the Mosaic and Mosaic Pro to facilitate the correction of neck relief (overbow or underbow) caused by string tension and/or changes in temperature and humidity. The amount of relief in either direction directly affects the instrument’s string height and playability. This model has a single rod for neck adjustment. Dual graphite bars embedded in this neck add extra stiffness and assist the truss rod in providing a balanced adjustment. Making adjustments. Locate the adjustment nut at the heel of the neck. Using the 9/64" hex wrench supplied with your instrument, turn the adjusting nut clockwise to decrease the amount of relief and straighten the neck, or counterclockwise to increase the amount of relief giving the neck underbow.